Buffalo's Zoning Board of Appeals is used to protesting opponents of projects and the zoning variances needed to build so many of them. 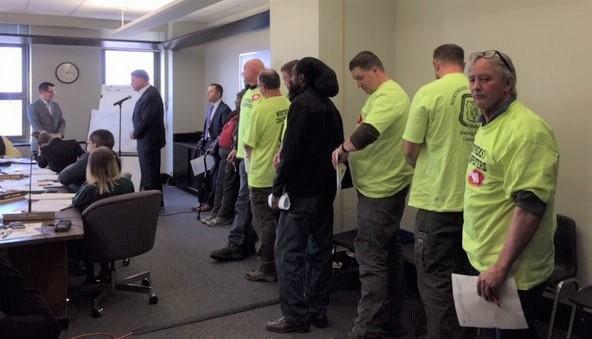 On Wednesday, a large group of carpenter union members showed up to protest the variances for a signature project on Jefferson Avenue. The 1200 Jefferson building is in a section of the street with a series of recent additions, like a new bank branch and a People Inc. housing development. The new building would house Say Yes Buffalo and a group of other non-profit agencies. Say Yes Executive Director David Rust said it is a big move. "We think about who we employ. We have a very diverse work force. How we spend our money. We want to ensure that this is an equitable scholarship for kids across the city. We care about how we spend our money as a employer and, I think, it's important where we're located," Rust said. "So we chose to make an investment on the East Side of Buffalo, to move our office onto Jefferson Avenue. We think it's a signature statement. There's other non-profits coming with us." Rust said there will be 40 staffers based in the building, with those who shuttle in and out making good use of the large parking lot. The project needed a lot of variances and most were granted. Each of the seven variances requested brought a green-T-shirted union member to oppose it. Local 286 Business Representative Daryl Bodewes said it was not because CSS Construction is non-union. "No. It has nothing to do with the union-non-union issue. This is all about the variances," Bodewes said. "There's a project here. They're requesting seven variances. We think that they are substantial variances. They want to build a building, we're good with it. But these Green Codes that were designed over on the wall over here, they should be followed. So that's all we're asking. Follow them. It has nothing to do with a union-non-union issue." Bodewes said union members will be back, pushing for enforcement of the Green Code. After extended debate, Zoning Board members let the project go forward by approving most of the variances. Kevin Hayes said Jefferson needs development to bring the street back to the major business street it once was. "Challenges on Jefferson, on the strip, on the commercial strip, basically amount to me in light of long observation reflect a lack of people nearby, which really means they need more houses off the main street," Hayes said. "We also need to consider, under the Green Code, to be rebuilding Jefferson the way it used to be." Hayes was specifically opposed to parking spaces on the Eaton and Northhampton corners of the building.